A schlemiel may be, must be, grievously acted upon by the always malevolent world. But he can never be permitted to act effectively against that world. At the end of his adventures he must, somehow, triumph over the forces of darkness that surround him  but only accidentally so. That's why we identify with him; if he is one of us, we know perfectly well that we wouldn't last a minute against all those men in black wielding highly advanced weaponry. In that spirit of genial fantasy, we permit out surrogate that utter self-confidence, that sublime sangfroid, with which with he cheerfully motors his way around and through disaster. He's what we would be  in our dreams  if we had any luck. There was a lot of this peculiar energy in the characters portrayed by the great silent comedians. And there was a lot of it in Maxwell Smart, the doofus, inanely self-confident secret agent Don Adams played in Get Smart, the iconic 1960s television series in which Mel Brooks and Buck Henry started satirizing James Bond almost before he made his first smirking wisecrack to Miss Moneypenny. One dared wanly to hope that the loose, slightly impoverished air of that funny, curiously memorable little enterprise might somehow prevail in our era of more grandiose imagery. To be honest, that hope began to darken as I thumbed through the production notes prior to a screening of Get Smart. Many persons involved with the movie prattled on about their swell new action sequences "worthy of any thriller" with their up-to-date "scale and scope." Scale? Scope? Are they kidding? Here's the deal, guys: action sequences are not funny. They never have been and they never will be. For they require that their protagonist set aside his bumbling physical incompetence and start acting decisively and heroically. At which point our connection with him is broken and he becomes just another guy who might as well be named Edward Norton. Or Bruce Willis. That Max Smart is played by the admirable Steve Carell, who is desperately looking for deadpan jokes in all the wrong places, is beside the point. So, too, is that his sidekick is played by the lissome Anne Hathaway, who also seems willing to go along with a gag if only she could find one. Or that their nerdy colleagues in CONTROL have a few attenuated comical moments in their fight to save the free world from KAOS. They are all strapped to a hurtling plot line that is heading from one fireball to the next, with only a few not-so-hot Bush-Cheney jokes to divert them. And us. "Forget it, Jake, it's summertime," a cynical voice whispers in my ear, and I know he's right. You cannot expect a bunch of vacationing kids to remember, let alone revere, a cheeky little TV half hour that entertained the old folks almost a half century ago. For all I know, it was not as funny as we thought it was back in those less megalomaniac times. But Charlie Chaplin used to say that all he needed to make a comedy was a park, a policeman, a pretty girl and his divinely innocent self. Of course, he was touched by genius and the people who make movies like Get Smart are touched by no more than the unwise desire to spend someone else's money on special effects that are inherently antithetical to the antic. The phrase someone ought to be whispering in their ears is "Less is more." 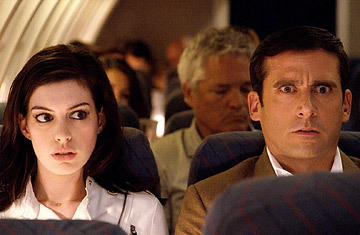 It's a concept that might have been catnip to a superb minimalist like Steve Carell.